Background: Achieving a good satisfaction with anticoagulant treatment should be a target in Atrial Fibrillation (AF) patients. Objective: To ascertain the perception of patients regarding burdens and benefits of anticoagulation with Vitamin K Antagonists (VKA). Methods: This was a multicenter cross-sectional/retrospective study conducted throughout Spain, in which AF patients taking VKA during the last year, attended at primary care setting were included. The Anti-Clot-Treatment Scale (ACTS) was used to determine perceived burdens and benefits with anticoagulation. Results: Overall, 1,386 patients (mean age 77.4 ± 8.7 years; 48.6% women; 64.2% permanent AF; CHA2DS2-VASc 3.9 ± 1.5; HAS-BLED 1.6 ± 0.9) were analyzed. The adequate anticoagulation control was achieved by 56.9/60.6% of patients according to direct method/Rosendaal method, respectively. Overall, mean ACTS Burdens scale score was 49.4 ± 8.8 and mean ACTS Benefits scale score 11.2 ± 2.2. Active patients, polymedication, elderly and visits to the nurse were associated with higher scores in the ACTS Burdens scale (lower perceived burden), whereas visits to the emergency department and primary care physician were associated with lower scores in the ACTS Burdens scale (higher perceived burden). Active patients, number of INR determinations, visits to the nurse, and an adequate INR control were associated with higher scores in the ACTS Benefits scale (higher perceived benefit), whereas visits to the emergency department and to the primary care physician were associated with lower scores in the ACTS Benefits scale (lower perceived benefit). Conclusion: Satisfaction with treatment was high among patients with AF chronically anticoagulated with VKA, suggesting that quality of life is not impaired in this population. Keywords: Anti-Clot-Treatment Scale (ACTS), atrial fibrillation, benefit, burden, quality of life, vitamin K antagonists. Keywords:Anti-Clot-Treatment Scale (ACTS), atrial fibrillation, benefit, burden, quality of life, vitamin K antagonists. Abstract:Background: Achieving a good satisfaction with anticoagulant treatment should be a target in Atrial Fibrillation (AF) patients. 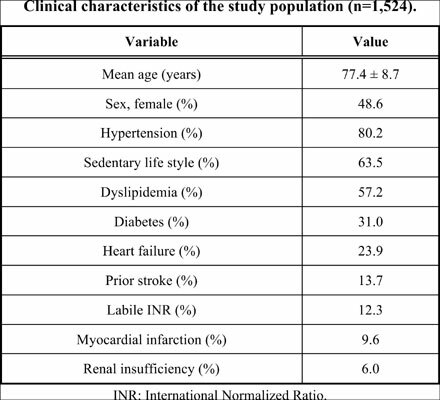 Sympathetic Overactivity in Patients with Chronic Renal Failure - The Culprit of Increased Cardiovascular Mortality? Infective Endocarditis Complicating Hypertrophic Obstructive Cardiomyopathy: Is Antibiotic Prophylaxis Really Unnecessary? Calcium Sensitizers in Cardiac Surgery: Who, When, How and Why?